1 November 2016 Babak Golkar is happy to engage viewers on many levels with his work. 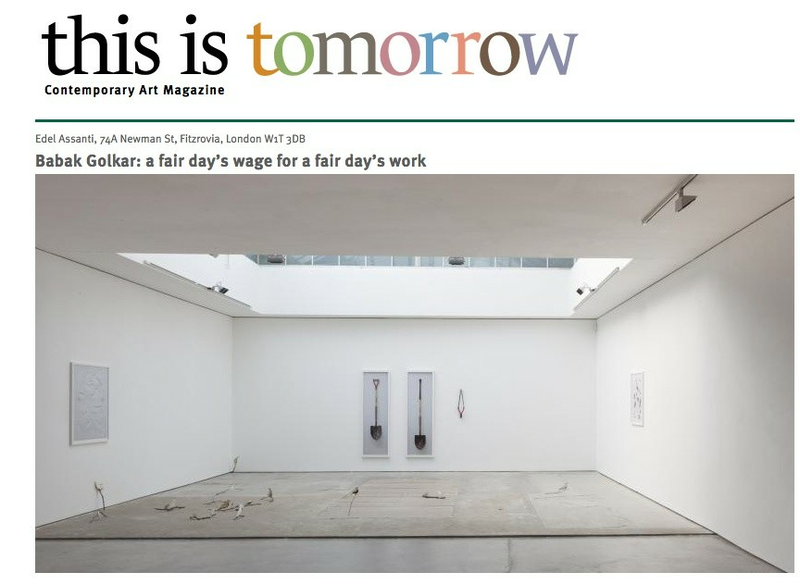 His debut solo exhibition in London at Edel Assanti, ‘a fair day’s wage for a fair day’s work’, sees Golkar, who was born in Berkeley, grew up in Tehran and now lives and works in Vancouver, employing the second instalment of his ‘Return’ project. Here, Golkar’s work includes social intervention, whereby an ordinary consumer object is bought, documented with photography and then minimally edited to become a unique work of art. The object is re-photographed and then, with the original tags kept on, returned back into the commercial world unbeknownst to the company the item was bought from. With the left over material from the product’s transformation he makes a further unique work of art. Golkar creates a residual object that accompanies the photographic diptych which is located within the broader theme of labour, geopolitics, workers’ rights and globalisation. There are distinct areas within the show’s aesthetic. On entering the gallery, smaller black-framed photographs of re-gold-plated nails and a fake diamond ring engraved with Golkar’s name, playfully ease the viewer in to his intervention process. But it is with ‘From E.I.C. with Love (with Hessian Glove For a Ten Year Old Boy)’ (2016), towards the centre of the gallery, that Golkar really starts to show the prowess of the project. In this work, a spool of hessian is photographed on a white background. On it can be read ‘handcrafted in India’. In between this and the right-hand photograph is a pair of gloves hanging solemnly, hand knitted with the original hessian to the exact hand size of a ten-year-old boy. In the altered image to its right, the same spool with has been restrung with red, white and blue ribbon. The phrase ‘handcrafted in India’ immediately becomes weighted by colonialism, particularly that of the British in India, and the lasting effects that this has had on the way its people have been utilised as an ungoverned workforce by companies for maximum profit at the expense of child labour. It also summons the false patriotism instilled by colonial rule – the promise of a free land where a better life is readily available to all. Opposite ‘From E.I.C. with Love (with Hessian Glove For a Ten Year Old Boy)’, and perhaps the most striking piece in the exhibition, is ‘Shepherd and the Witch (with Primitive Accumulation)’ (2016). In this work, two large vertical photographs depict, on the left, a wooden broom with a red handle leaning back against a wall that cuts across the composition. The photograph on the right depicts the broom now using the curved end of a walking cane as its handle. In front of it sits a flute made with the wood of the original handle in a wooden box, the same colour as the frames for these works, on top of a plinth. The broom is a symbol of menial work and low paid labour, often an accessible way to earn money to send back to those at home. In creating these diptychs and unique objects, Golkar engages in discourses upon contemporary labour. In ‘Arm (with In Advance of Broken Head)’ (2016), a handle of shovel has been altered into the handle of baseball bat so that it becomes and implement of violence. The two photographs showing the original and altered product are on the far wall of the gallery. In white frames and set against white backgrounds, the distinctive colours of black and red exude an authoritarian tone – almost as though it were a stereotypical visualisation of something sinister. The objects and their presentation emphasise the violence and coldness that is so often associated with labour and capitalist ideologies. Yet, as Golkar returns these objects to everyday life, back into the circulation that was intended, they have become authenticated art pieces. One cannot help but wonder, as his career keeps climbing, what will happen to the value of these works. Golkar has created an impressive and subversive value increase, though this remains largely unknown to all but those who are familiar with his work.